Bank cofounders and lifelong partners, John Jewett and Peter Decker had one of the few banks that survived the Depression of the 1920s and l930s. During a robbery attempt, Jewett and cashier Atkins Bingham foiled the crime by shooting the bandit with guns hidden under the bank counters. 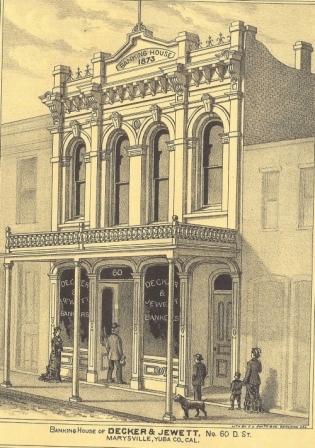 An 1853 Marysville city directory states both Decker and Jewett lived upstairs from the bank. Being the oldest out of 447 banks in California, it closed in 1934. The building was demolished in 1977.